One of the primary attributes that separates Mobile Softwash of Maine from the competition is that we use top-of-the line Softwash technology, which is much more effective than high pressure washing (traditional power washing). The main difference is that Softwash uses low pressure equipment, which reduces the likelihood of extraneous damage to surface materials or surrounding plants and vegetation. But that’s certainly not the only difference. Softwashing involves the use of special chemical formulations that are customized based on the characteristics of the cleaning job at hand. These chemicals are 100% biodegradable and environmentally-friendly, and are designed to kill all the organic materials that create nuisance stains and surface deterioration. The process boasts a 100% kill rate, so nothing is left behind. Once the harmful microorganisms are killed, they – along with inorganic dirt and grime – are gently washed away. Softwash technology is more efficient than traditional high-pressure washing equipment because organic microorganisms are responsible for the vast majority of staining that occurs on external surfaces. Softwashing attacks these nasty organic materials at their core while also removing inorganic buildup. The technology also leaves behind special chemical inhibitors that slow the re-growth of these materials. 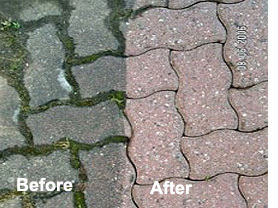 The result is a highly efficient process that lasts 4-6 times longer than old-fashioned pressure cleaning, and uses 66% less water. Softwash cleaning is the recommended method for any building, structure or exterior surface: roofs, siding, windows, driveways, parking lots, solar panels, concrete surfaces, decks and fences, awnings, and any other external surface or structure you can imagine. No matter how you slice it, the Softwash process is exponentially better than high pressure washing or even low pressure power washing. When incorporated into an annual maintenance plan, softwashing the exterior surfaces of your home or business offers tremendous bang for your buck. 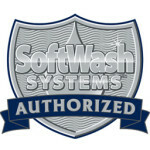 Call Mobile Softwash of Maine today for a free, no-obligation estimate.